Whitesnake were joined by Glenn Hughes for a pair of Deep Purple classics at the Saban Thatre in Beverly Hills, California on Tuesday. “The Purple Album” recently debuted on the US charts, opening at No. 6 on the Top Current Hard Music Albums, No. 15 on Top Current Rock Albums, No. 43 on Top Current Albums and No. 84 on the Billboard Top 200 Charts. 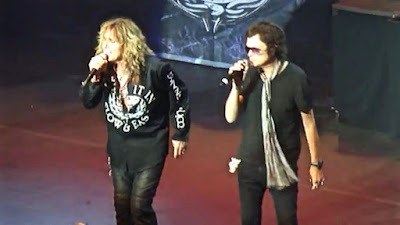 Whitesnake’s North American tour - which kicked off May 28 in Airway Heights, Washington – runs to mid-August before the group takes a break, after which they’ll hit Japan and Europe in the fall. Hughes has just announced tour dates for South America and Europe, a run that will see him joined by former Whitesnake and current Revolution Saints guitarist Doug Aldrich.